Dan M. Goebel received a B.S. in physics, an M.S. in electrical engineering, and a Ph.D. in applied plasma physics from the University of California, Los Angeles, in 1977, 1978 and 1981 respectively. He is a Senior Research Scientist at Jet Propulsion Laboratory, an Adjunct Prof. of Electrical Engineering and Aerospace Engineering at UCLA and an Adj. Prof. of Electrical Engineering at USC. At JPL he is responsible for the development of high efficiency electric thrusters and advanced spacecraft technologies. 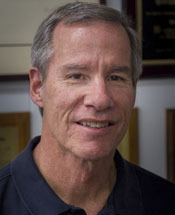 Previously he was a Research Scientist at HRL Laboratories in Malibu, CA and Principal Scientist at Hughes/Boeing EDD in Torrance, CA where he was the supervisor of the Advanced Technology Group for microwave tube development and the lead scientist of the XIPS ion thruster program for commercial satellite station keeping. Dr. Goebel is a member of the National Academy of Engineering, Fellow of the AIAA, Fellow of the IEEE, and Fellow of the American Physical Society (APS). He is the author of over 125 technical journal papers, 150 conference papers, one book entitled Fundamentals of Electric Propulsion: Ion and Hall Thrusters published in 2008, and holds 53 patents.